Simple, fast, cheap and environmentally friendly! With the e-Invoice service, you’ll simplify your business and save a lot of time and – more importantly – money. 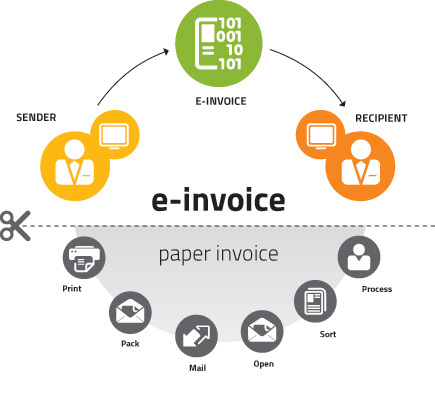 More and more users trust e-Invoice every day, because they are aware that paper is history. Just like e-mail usurped the throne of paper mail, so will e-Invoice save you from having to stand in line at the post office. The advantages are clear; electronic invoices are cheaper to issue and distribute, simpler to check for correctness, receiving can be automatic, and they can be delivered to several addresses simultaneously in any format and in different media. After receiving it, it can be paid without any retyping. It’s for everyone who wants to work with invoices in a simple, clear, modern, environmentally friendly and cost efficient way. This goes especially for businesses that deal with the public sector, because each invoice issued to the public sector has to be electronic. If you need help deciding, want an estimate or just want additional information, just give us a call or send your questions via e-mail.